My mother is one of my biggest fans when it comes to my crafting. So when she has her birthday I really want to do something special. And as so often, Sam Clayton from Mixed Up Craft comes to the rescue. I made a card, a chocolate treat box and a gift bag that Sam designed. I followed her instructions on YouTube and did some small alterations. Sam did a fun YouTube video on the “Inside Pop Up Card”. I changed the dimensions to a standard A6 card. For the flowers I used the “Four-Petal Flower” punch. I punched out a lot of flowers in Pineapple Punch and Blueberry Bushel cardstock and DSP. For the leaves I used the “Leaf” punch and Call Me Clover cardstock and DSP. For the centre of the flowers I colored some white enamel dots with my Stampin’ Blends. I stamped a lot of butterflies from the Butterfly Gala stamp set and colored them with Stampin’ Blends. The Butterfly Duet punch makes it easy to punch out all the butterflies. I arranged the flowers, leaves and butterflies to make a fun spring scene. I decorated the front of the card by stamping several of the leaves and sprigs from the stamp set Pop of Petals. The front of the card is rather serene, and then when you open the card there is an explosion of spring. The card is pretty bulky and doesn’t fit a regular envelope. I decided to make a reinforced box that fits the card perfectly. 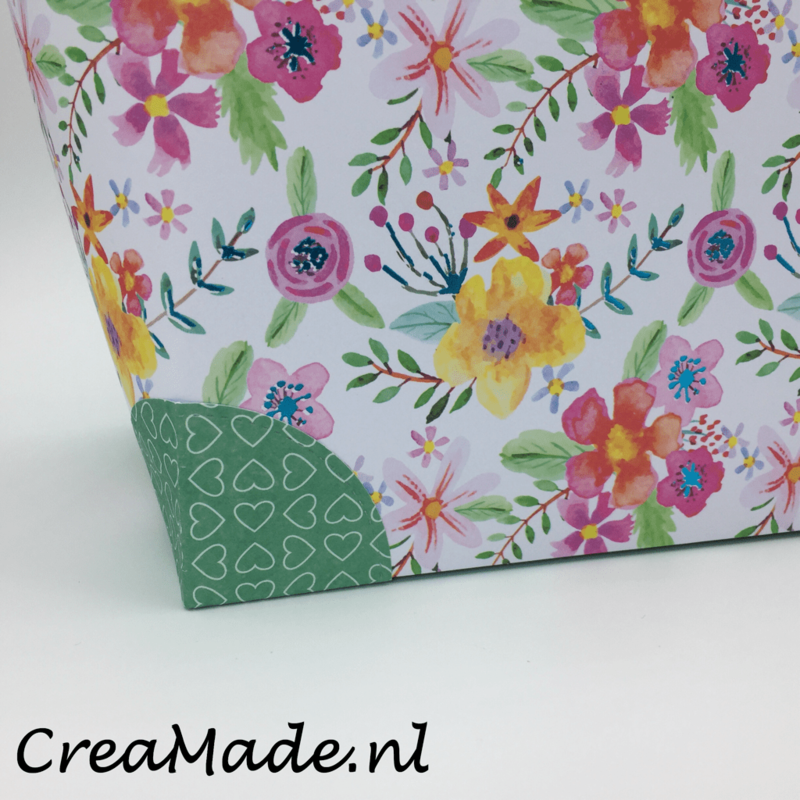 I decorated the box with one of the cards from the “Happiness Blooms Memories & More” card pack. The colors match the colors of my card exactly. Of course, I had to make a treat box as well. Again, I decided to do the Stepper Box by Sam Clayton. I adjused the measurements so four Ferrero Rocher chocolates fit in the box. My box is about 5 1/2″ tall and 1 1/2″square. 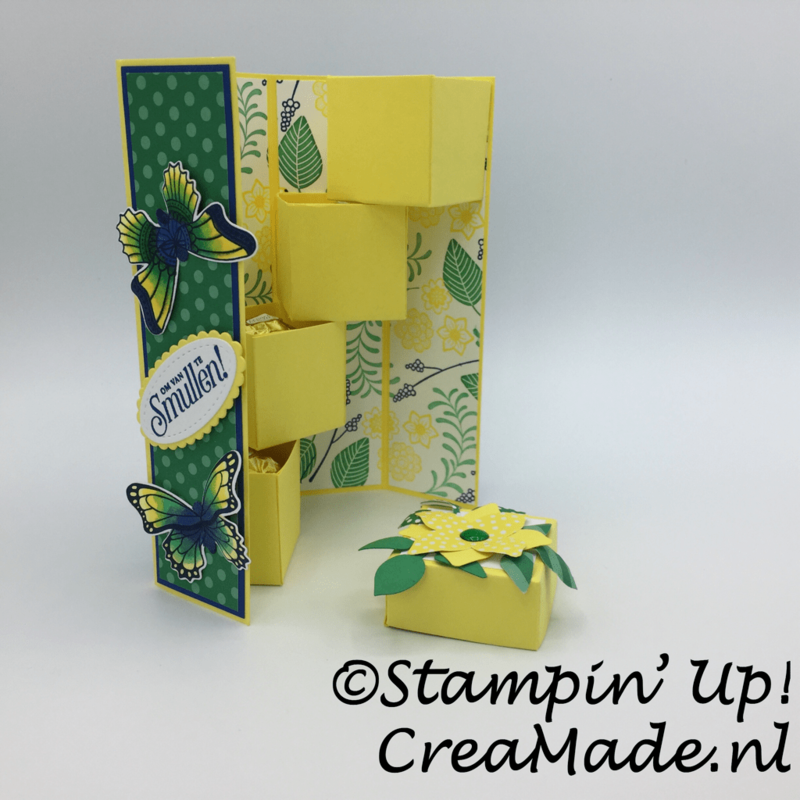 I had a lot of flowers and butterflies left and used some on the Stepper Box. For the inside I stamped my own DSP using the leaves and small flowers from the Pop Of Petals stamp set. For the outside of the stepper box I used some Call Me Clover DSP, matted on Blueberry Bushel. The Pineapple Punch color I choose because yellow is my mother’s favorite color. Funny to see how different this box is from the small treat boxes I made last week. They are made the same, only the dimensions are different. I had some time left and I had to make one of Sam’s beautiful gift bags. I choose the “Large Tote Gift Bag” that Sam did a few weeks ago. I used two sheets of 12″x 12″ paper form one of the paperpacks I bought at Action. This one has beautiful flowers and the colors resemble the ones in my card and chocolate box. I also choose a sheet of an other paperpack that matched the flower paper, but isn’t so busy. There are small hearts on the paper. For the closure I like to use magnets, as I am not so fond of velcro. I used four 10 mm round magnets and they make the bag close very easily. I am also not a fan of big bows so I changed that as well. I choose a small bow and a charm that says “Made for You”. It is a really big bag and my mother loved it. Dank je. Mijn moeder was er blij mee.